What Is Marketing Cloud Connect? Salesforce has two different desktop user interfaces: Lightning Experience and Salesforce Classic. This module is designed for Salesforce Classic. Explain what Marketing Cloud Connect is and what it does. Describe the benefits of using Marketing Cloud Connect. Explain the system requirements for setting up Marketing Cloud Connect. 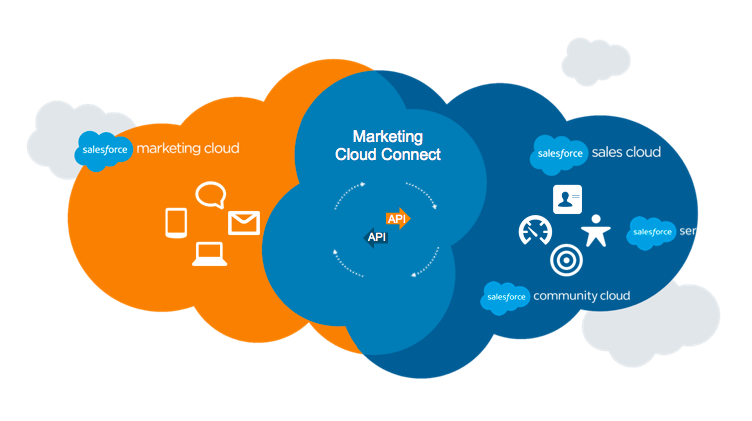 Marketing Cloud Connect integrates your Salesforce Marketing Cloud instance with Salesforce Sales, Service, and Community Clouds. It’s an easy-to-configure set of functionality that can bring great benefits to your marketers, sales and service reps, and—most important—your customers. Marketing Cloud has tools to build beautiful and highly personalized emails. With Marketing Cloud Connect, you combine the power of Email Studio with access to Salesforce reports and campaigns. That connection lets you easily target customers and personalize messages to them using all your CRM data directly in Marketing Cloud. Likewise, sales and service reps can send individual or bulk emails from Marketing Cloud, but within the app they’re most familiar with—Sales, Service, or Community Cloud. Marketing Cloud Connect also exposes all of the email tracking history on each recipient’s contact record in Sales or Service Cloud. This capability enhances each customer’s profile in Salesforce CRM and improves your single, 360-view of that customer. Marketers can easily integrate record data from CRM to build out highly targeted audiences for email sends. For example, a marketer can compile a target audience based on a combination of attributes from data in Marketing Cloud, such as “Visited website in last 2 weeks,” and CRM data, such as a checkbox on the contact record that indicates the person is a key decision maker. And there’s no need to import CRM data or schedule automations. With Synchronized Data Sources, you simply point and click. All your CRM standard and custom object data is available in Marketing Cloud, synchronized automatically, so you can personalize your messages based on your most current customer information. Here’s where things really get interesting. With Marketing Cloud Connect and Journey Builder, you can listen for events from Salesforce CRM—such as a new contact being created or a service case being closed—to launch customers into journeys and to trigger the initial email, SMS, or push message. And then, depending on how your customers interact with those messages, Journey Builder can create or update records within Sales, Service, and Community Cloud as activities within a journey. For instance, closing a case in Service Cloud can start a journey in Marketing Cloud that sends a satisfaction survey to the customer. Based on the customer’s response, you can use additional logic to trigger additional messages or actions for follow up. And if you have both Marketing Cloud and Community Cloud, you can drive engagement by triggering a journey when a new user joins your community, or when a user posts a comment or asks a question. So marketers and community managers can connect experiences across every touchpoint. Now that you know what Marketing Cloud Connect can do for your business, you probably want to dive in and get it set up. But before we move on to the installation and configuration steps, let’s briefly review the system requirements for your Marketing Cloud and CRM environments. Marketing Cloud Connect requires a relationship between a single Marketing Cloud account and a Salesforce CRM org. It’s possible to connect a Marketing Cloud account to multiple Salesforce CRM orgs, but we don’t cover that setup in this module. Ensure that you have four custom tabs available in your Salesforce org. For most Marketing Cloud Connect functionality, users need a Marketing Cloud license and a Sales or Service Cloud license. The Salesforce CRM org must be one of the following versions: Salesforce Unlimited, Enterprise, or Performance Editions, or Developer Edition Sandbox. To find out which version you’re using, see the Salesforce Help article Find Salesforce Edition and API Version. Marketing Cloud Connect features work in Salesforce Classic. If you use Lightning Experience, you are automatically redirected to Salesforce Classic when you click any of the Marketing Cloud Connect tabs.